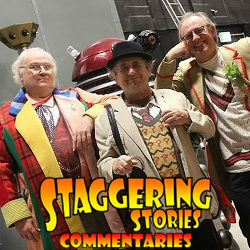 Adam J Purcell, Andy Simpkins, Keith Dunn and Scott Fuller sit down, parodied, in front of the Doctor Who 50th anniversary related spoof, The Five(ish) Doctors Reboot, and spout our usual nonsense! BBC: Doctor Who – The Five(ish) Doctors Reboot. Wikipedia: Doctor Who – The Five(ish) Doctors Reboot. This entry was posted on Sunday, December 29th, 2013 at 12:02 and is filed under commentary, Doctor Who, podcast, review, Sci-Fi, staggering stories, Staggering Stories Commentary Podcast, Staggering Stories Podcast, tv. You can follow any responses to this entry through the RSS 2.0 feed. You can leave a response, or trackback from your own site.